Dealing with the twin epidemics of obesity and diabetes is a challenge for anyone. Because these two related conditions can rob individuals of their ability to regain health through diet and exercise, we need a dramatic – but safe and natural – approach. To say that we have an epidemic of obesity and diabetes in America is no longer a headline. It’s a daily reality. Statistics from the Centers for Disease Control (CDC) show that as of 2010, over 35% of American adults and over 16% of American children and adolescents were obese. Approximately 33% of American adults are not yet obese, but still classified as overweight. “Overweight and Obesity.” Centers for Disease Control and Prevention. Available at: www.cdc.gov/obesity/data/adult.html . Accessed: April 10, 2013. 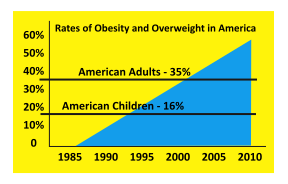 “Obesity and Overweight.” Centers for Disease Control and Prevention. Available at: http://www.cdc.gov/nchs/fastats/overwt.htm. Accessed: April 10, 2013. And while obesity is a condition that is plainly seen, the damage done by elevated blood sugar levels – Type 2 Diabetes – happens slowly over time. You may not notice it at first. But Type 2 diabetes and elevated blood sugar is becoming frighteningly common as well. 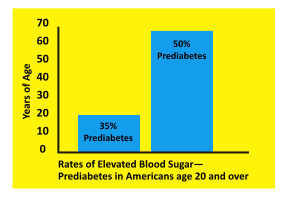 Approximately 35% of Americans age 20 or older have “prediabetes”. That number soars to 50% when you look at statistics for Americans age 65 or older, to a total of about 79 million people. And that’s not even counting those who have undiagnosed diabetes, which is estimated at 7 million possible cases. With these statistics, you may wonder what can be done. And in fact, what many people may not realize is that at a certain point, they aren’t responsible for their weight. Their body simply works against them. Over time, the brain stops interpreting the signal of satiety and simply revs up the desire in individuals to eat even more. Part of the problem, of course, is the popularity of high-fat foods (considered “nutrient-dense” but by no means nutritious by dieticians). But in the case of “diabesity” – the twin problems of diabetes and obesity -- the body essentially takes over, and blood sugar regulation, metabolism, and fat growth are beyond the ability of willpower alone. In diabesity, as your blood sugar elevates, you become insulin resistant. As you become insulin resistant, instead of sugar being burned, it adds to your weight as fat. As this cycle continues, you simply aren’t going to metabolize food properly anymore. Fat cell growth and expansion occurs the same way as tumor cell growth -- through angiogenesis, the formation of new blood vessels that “feed” the fat cells. So ideally, aside from inhibiting calorie intake, you need to stop the expansion of fat cells altogether. 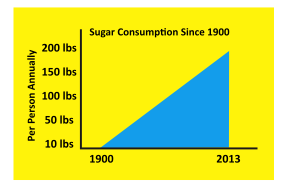 You’d think that we could avoid this problem altogether by simply not consuming sugar and sweeteners. But sugar and sweeteners are everywhere. “Profiling Food Consumption in America”, Chapter 2. USDA publication. Available at: http://www.usda.gov/factbook/chapter2.pdf. Accessed: May 7, 2013. But those calories – called “empty” by some and the most likely to cause you to gain weight – have become the easiest to find -- and at what a price. People have essentially become “re-wired” to eat highly processed, sweetened food, making the likelihood of becoming overweight or obese almost a certainty. In this case you eat more of this processed food, you gain more weight, your blood sugar levels rise, and the entire cycle starts a spiral that is painfully difficult to stop. But there is help on the horizon from a natural source – curcumin from turmeric (Curcuma longa). There is exciting evidence that it can help your body regulate blood sugar levels, burn fat for energy more efficiently, and stop new fat cells from expanding or even forming in the first place. Obesity and diabetes both share one thing in common – inflammation. In fact, obesity is associated with an increase of pro-inflammatory TNF-alpha and activation of NF-kB in fat, muscle, and liver tissue. However, stopping the over-activation of these factors also helps the body prevent insulin resistance, so circulating blood sugar is less likely to be stored as fat. However, research has shown that even on a high calorie diet, curcumin still interrupted the process of fat growth. In a laboratory study of animals fed a high fat diet, curcumin supplementation prevented the increase of adipose (fat) tissue as well as preventing fat deposits in the liver. In this study, it only took between 3 to 9 weeks before the benefits of curcumin supplementation became apparent. This research showed that curcumin significantly inhibits two of the major genetic factors in fat cell creation -- PPAR-gamma and C/EBP-alpha. So, at a cellular level, curcumin stops the growth of fat – even when food intake wasn’t reduced. The curcumin group in this particular study also showed lower concentrations of serum cholesterol and triglycerides than the high-fat diet group without curcumin. Plus – and I think this is just as key as the fat-inhibition effects – the curcumin group had lower concentrations of serum glucose. Plus, the curcumin didn’t interfere with the normal development of healthy cells. In another study, curcumin decreased glucose levels in less than 2 weeks of treatment, lowering HbA1c levels in diabetic mice without affecting HbA1c levels in lean mice. HbA1c tests show the average levels of blood sugar and are a way to gauge the control of diabetes. Here again, there were significant weight differences between curcumin-fed lean groups, diabetic/obese curcumin-fed groups, and diabetic/obese control groups as well. Curcumin was associated with less body fat and more lean mass in both the curcumin groups, and the curcumin-fed groups actually lost weight 2 weeks into the study. One potential explanation for this is that curcumin moderates the inflammation that would normally be caused by a high-fat diet, inhibiting NF-kB expression and JNK signaling. This, in turn, prevents the creation of fat cells that would normally be one of the results of systemic inflammation.7 Plus, curcumin has been shown to inhibit macrophage infiltration into adipocytes, which ramps up fat cell production as well. Another factor that supports curcumin as a treatment and preventive agent for diabesity is that curcumin appears to increase levels of adiponectin. This protein normally circulates throughout the body, but is present in lower amounts in obese versus lean body types. Aside from keeping lean bodies lean, adiponectin is also important for blood sugar levels and insulin metabolism. In fact, boosting levels of adiponectin is considered a potential treatment for type 2 diabetes on its own. But although it acts as an anti-inflammatory, high inflammation still reduces adiponectin levels in the body, virtually eliminating any protective effect it would have against weight gain or insulin resistance. This is another reason why curcumin shows so much promise – it helps the body protect itself and appears to work synergistically with existing natural chemistry. However, I believe it is critically important to use a curcumin that is readily absorbed and remains at viable levels in the body. While much of the supplemental curcumin out there is available as standardized 95% extracts, there is a curcumin source that has up to 10 times the absorption and greater blood retention time at meaningful levels compared to standardized extracts. It has been verified in human safety studies and is being used in cutting edge research around the world. The high-absorption curcumin I recommend is extracted from turmeric that is already high in curcumin value and then naturally reduced to a small particle size and re-blended with turmeric essential oils. Certainly, a whole food, low-sugar diet and sensible exercise should always be part of any weight loss regimen. But along with that, I believe that incorporating a high-absorption curcumin into your daily routine is critical as well. Whether you’re dealing with obesity or just a few extra pounds, it will help you stop the inflammation that undermines your best efforts.